I will definitely share my progress as time goes on! I've got a local wine shop that has a couple of locations carrying a few racks. I haven't really gone out to sell the stuff to shops too much, but that could definitely happen in the future. I like the idea of putting together a pamphlet of what I can do and sending it out to local wine shops and wineries, as we have a pretty nice wine industry a couple hours away up in Traverse City. The personalized plate idea is a good one! 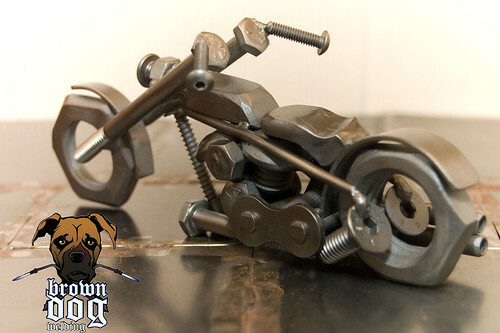 I've had a few friends bug me to get my bikes into the local harley dealers, and I may do that sometime too. Right now I'm selling them pretty well through my site, and through my site I get close to 100% of the profits Going through dealers/stores I'd get 60-75%. Obviously I could make up for that in volume, but I'm not really into volume yet! I make every single bike different, I name and number each one, and I think that's part of the appeal. That's where me trying "making choices in how I do things" that I mentioned in the last post comes in. I'd like to carve out a niche doing everything one off, and I think I'm off to a decent start. We will see how I maintain! Awesome stuff on that site man. I give huge amounts of credit to you for being creative enough to think some of those things up. I've got a page up for some of my shirts/hats/ect. up. There isn't a tab for it yet on my site, I may mess around with the pics yet, and the sizes are limited right now with the shirts(I need to order some more), but I think I got the basic setup right. Let me know what you think! Hey Josh, I like that you got the shirts and beanies up on your site, but I think you should downscale on the wording that describes the cotton blend, etc. TOO LARGE I'm thinking at all other websites that we see (ok, mostly welding), but look at the comparison/size of the fonts for the descriptions, compared to the size of their pics. Last edited by jdustu; 03-17-2009, 10:58 AM. The boy definitely has talent. 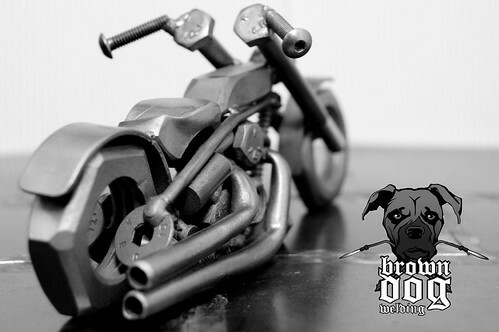 I did a dragster and another bike last week, pics are up on the site! I have my "merchandise" page(hats, shirts) linked on my main menu now. I cleaned the page up a bit, although in the future I'll get some pics that are all the same size to neaten it up farther. I really like your belt buckles. I am in a welding class and I was wondering where you get your blank belt buckles. I would like to create a couple ones for my self. I found a few online but they are kind of expensive. Thanks a lot. I didn't know dogs were metal heads, too.